I chose to study kung fu because I wanted to experience something completely new to me that would also be a great challenge. I also wanted to spend some time developing myself in a way that I wouldn´t have time for again once I restarted my career. 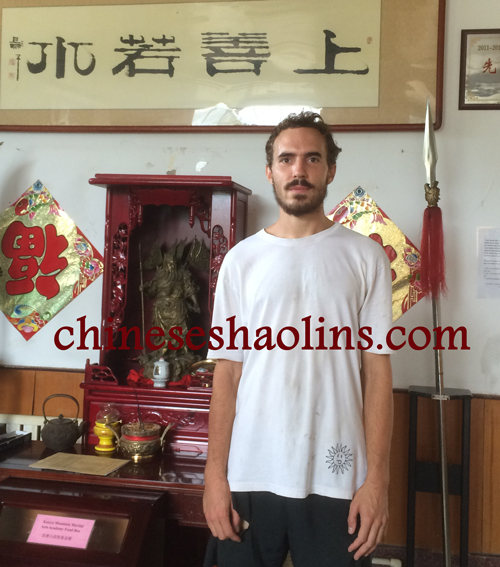 I´ve gained an enormous amount from being at Kunyu mountain Kung fu academy. Overall I´ve gained a lot more self knowledge and awareness - when you put yourself through this challenging environment you learn a lot about yourself. I´ve also gained a greater ability to perservere through difficult times.Qi Gong was especially helpful for this. Doing all the performances and sparring has given me a great amount of composure under stress. Physically I am, by a very long way, in the best shape of my life. I feel a lot more confident to try any new physical activity and certain that I will be a much faster learner of any physical skills in the future. I want to thank Loc for guiding me through Qi Gong towards the end of my stay, and Ariel when I started. I want to thank Master Guo for being patient with me in tai chi and giving me so much feedback over the many morning lessons I had with him. He has a really great balance between being positive/fun but also strict when needed. I'm also very interested in finding that balance for my job as a manager so I have learned a lot from Master Guo in this way. I especially want to thank my fantastic Master Meng. I feel very lucky to be able to have had Meng as my master, indeed to have been in Master Meng's first group is an honour. Maaster Meng is really good a focusing in on the technical details of kung fu in a way that ensures very fast improvement, but he also is really excellent at creating an atmopshere in the group in which everyone wants to work hard. Our group never had problems, and I´m certain that is due to Master Meng's leadership as well as the students' characters. My day would begin at 5am when I would join a small group of people doing QI Gong in the morning, I would then attend Tai chi at 6am in which I would continue to work on my form (eg 42 steps). After tai chi would be breakfast of porridge and soy bean milk - pretty delicious actually! Training starts at 8:30, finishes at lunchtime at midday. Then restarts in the afternoon - optional class at 5 o'clock for an hour before dinner. In my spare time I'd usually relax with the other students and chat or read a book. Having limited access to the internet was a nice change, so I've read a lot of books. I attended Mandarin class for most of my time here and they were much better after the teacher began to follow the textbook so that was a great improvement. It's very impressive how much the school has improved while I've been here, for example by building the new area for tea drinking and relaxing by adding more decoration to the garden, adding the new Chinese kickboxing bag area and multi-gym. All only in 6 months, and now also adding the new shop area. It gives me great confidence to see the amount of fund the school re-invests in the buildings and general improvements - it shows that the school values student happiness above everything else. The mountains, lakes, flowers, trees, animals of the surroundings made me happier every day. The area is so beautiful I will definitely miss it. I came to avoid the pollution of the inland city I was in before and found an idyllic countryside retreat. I had an incredibly positive experience at Kunyu academy and will perhaps one day return to experience it again. Duncan spent half year to train kung fu here.